How do we keep Moving – when everything is in Pain!! At Active Life Chiropractic Singapore we see patient’s putting up, or suffering with discomfort on a daily basis. We always strive to help them to the best of our collective abilities however, sometimes the best route to recovery also involves movement. For those patients of Active Life Chiro, you will be aware the Dr Tina, Dr Ernesto, and Dr Casey and all incorporate exercise as a typical part of their treatment plans. It’s quite common that a patient will ask us what they can do to keep moving and exercise. When their lower back pain is making it difficult to work out – water therapy can be the answer. Remember, no one particular water therapy based exercise is the answer for everyone – so speak to your individual provider of Chiropractic First, to see if the following tips can be of usage for you. Water therapy involves exercising in an aquatic environment. The benefit’s it provides outweigh the very small and minor risks. While it is true to say that it might take slightly longer and may involve more effort to engage in Water therapy, the relief it can provide is worth it. 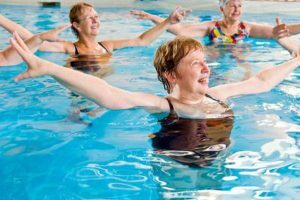 The simple fact that water allows for you to engage in an exercise program that creates resistance without impact on your spine. The buoyancy of water allows for the weight of the body to be supported, counteracting the usual forces of gravity. The resistance of the water too is of benefit, by making it slightly more difficult to move, the risk of further or new injury is also reduced. The fact that the water tends to be cool – for most cases is also of a benefit to the body as this can help to subside inflammation and swelling in most cases. Many patients that can benefit from water based exercise regimes. This includes: those who are struggling with Osteoarthritis. Patients suffering from Muscular strains and sprains. Patients with signs of Osteoporosis and even those patients who might be diabetic. Commonly, there are aqua-based exercise classes available throughout Singapore. Your Doctor of Chiropractic will be able to help recommend one that might suit you the best. Look for therapies that are low-impact while still providing some aerobic exercise. As always, if you have any concerns about your ability to participate, speak to our staff at Active Life Chiropractic or your primary health care provider. If you’re looking for more information regarding how you can get to exercising… call into either of our clinics. Our wonderful staff will be more than happy to assist with your enquiries.